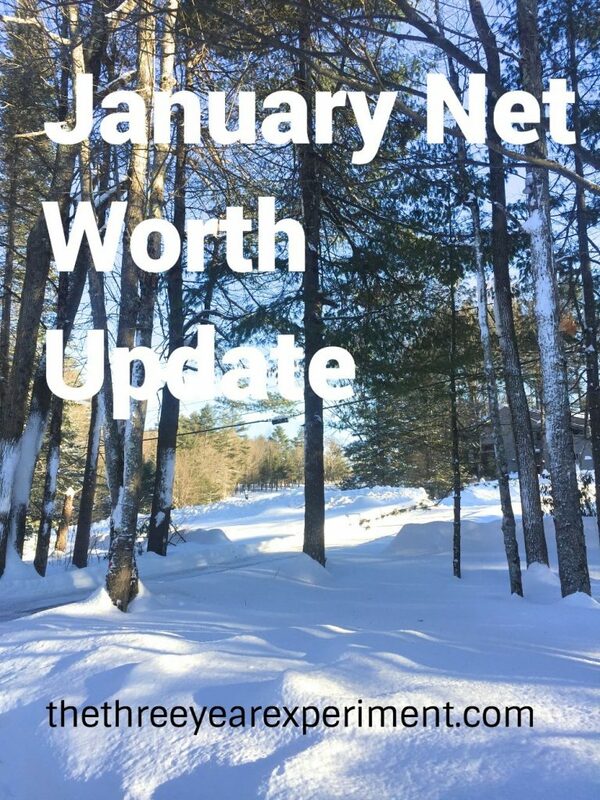 As of January 31st, our net worth has increased by a total of 36.2% from our starting point in December of 2016. In order to hit our goal of doubling our net worth in three years, we’ll need to increase it by an average of 2.77% each month (or 66.66% by this December), but we know that progress won’t be completely linear. 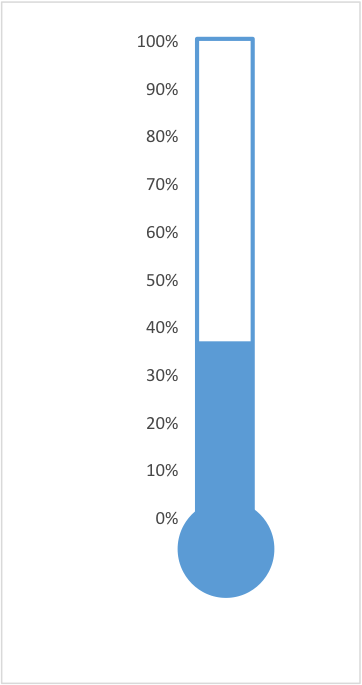 We may not quite hit our 66.66% goal for this year, but we hope that the increase in investment income and growth from that will make up for it in Year Three (but if the stock market drops precipitously? Who knows). Our net worth increased 4% from last month, but January’s stock market returns were really high. 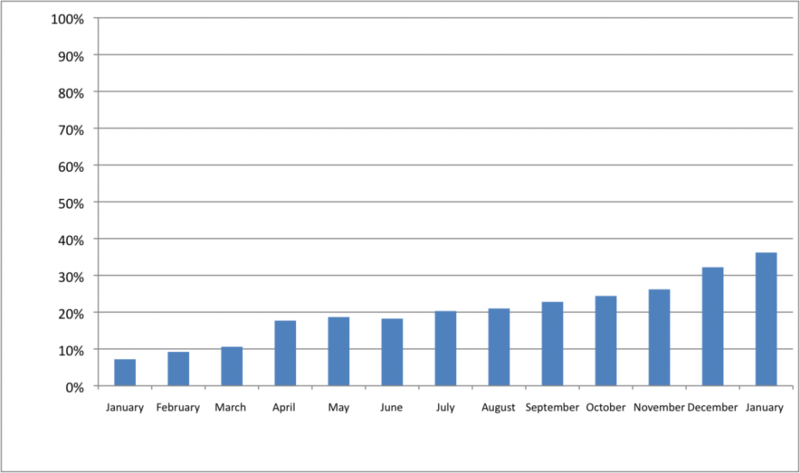 Our net worth doubling progress starting from last January. We are 36.2% of the way towards doubling our net worth as of January 31st, 2018. We know that we spend more than the average frugal financial blogger. But there’s nothing quite like publishing these figures to keep us honest. And I know publishing our spending will eventually change our spending habits. Slowly, but surely. Plus, we want to share with others that even if you have higher spending levels than other people, you can still achieve your financial dreams and goals. Housing: $1775. One fifteen-year mortgage payment. Taxes and insurance are not escrowed–we pay those twice a year. Auto license: $292.75. Our annual cost for the license (taxes) for both cars, which keeps going down. Yay for older cars! Auto maintenance: $504.00. I had a *fun* surprise when I got back from Chile. I needed new snow tires! So we bought them, had them put on, and had both our cars inspected. Groceries: $767.80. Month one of our Year of Good Food challenge, where we’re trying to keep grocery spending 20% lower than last year, or less than $772 per month. Eating Out: $70.10. We ate out one time at the kids’ favorite Mexican restaurant at Little ThreeYear’s request. Again, trying to keep Eating Out costs lower this year as well, although we don’t have a specific goal. Household goods: $33.08. A new mascara for me and an air popper. We kept burning our popcorn when we made it in a pot and also wasting half of the kernals that didn’t pop. This is way better. Kids’ expenses: $90.09. The drum rental and snacks for their Destination Imagination team, one book–the new Dav Pilkey Dog Man book (someone’s a little obsessed!! ), plus one babysitter from some months back. Mr. ThreeYear’s spending: $188.92. His normal eating out at work plus a new Amazon Fire device for our TV. Mrs. ThreeYear’s spending: $138.79. Yoga is the main cost here. Utilities: $626.15. Another propane delivery this month, but low electricity costs because of our trip. Clothing: $15.05. Mr. ThreeYear bought some body wash at TJMaxx. Haircare: $130.95. One cut for Mr. ThreeYear and one cut and color for me. Fitness: $208.48. Mr. ThreeYear had to do a different type of gym membership this month. He gets $111 back for three months if he works out 12 times a month (he will) so this isn’t quite as bad as it looks, but it’s still pretty high. However, it’s worth it to me for his mental health and well-being! Home Maintenance: $66.15. In addition to our curbside compost pickup, we bought new weatherstripping for our doors since we noticed that the cold is leaking in. We also bought some mousetraps. Joys of living in the country. Subscriptions: $27. Netflix, Spotify, Skype. Gifts: $153.87. Mr. ThreeYear’s birthday gifts and a friend’s gift. Vacation: $943.03. These are all of the expenses from our last week of our Chile vacation, including food, eating out, leaving some money for our water/electricity expenses, etc. Total: $6285.46. We spent $4510.46 without mortgages included. I was hoping for a lower month, but we had the vacay expenses, the snow tires, a propane shipment, and our auto license. I have to keep reminding myself that we’re trending downward! Behavior change is slow, but little changes add up over time. I know that at the end of 2018, our spending will be way lower than in 2017 AND we’ll have saved a lot more $$$!! 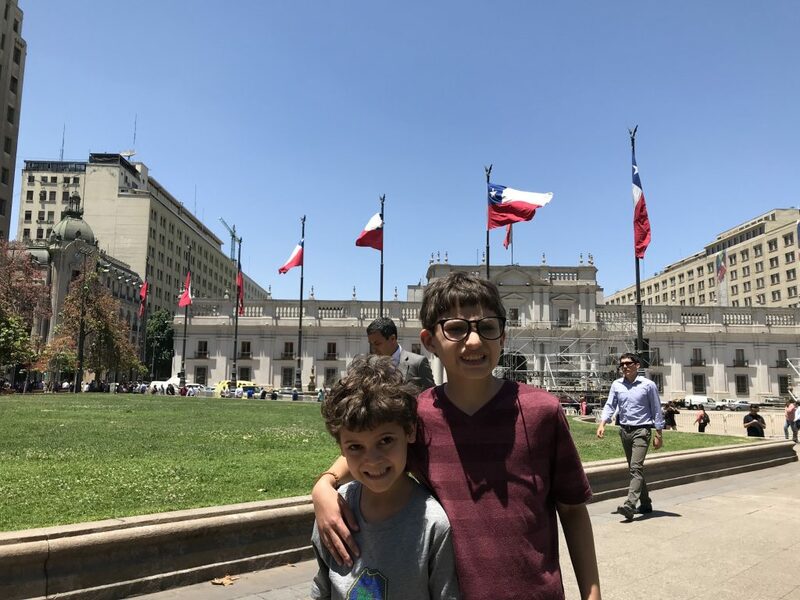 If you’re wondering how we were able to pay off $38,000 in debt and build a high net worth in less than ten years, read more about it, despite lots of mistakes and a late start, here and here. (Part of our success comes from keeping spending low on our housing and cars, and now trying to keep it lower in the third big $ category, food). As I type this, we’re getting another massive winter storm, about 12 inches of fresh powder! February is a pretty enjoyable winter month, as temperatures are generally a bit warmer and skiing is more fun, as there’s generally more snow (and time, during Winter Break!). As always, we’re optimistic for the future and excited to see what Year Two of our experiment holds. How did the first month of your new year go? I can’t believe it went so fast! Congrats on a great January! Good luck in 2018, Laurie! Great month Laurie! Which mascara did you buy?! Thanks Lily! From the Co-op, a supposedly natural one. I like it ok. It’s kinda flaky, though. Hi there! This is my first visit to your blog and I wanted to comment and say great post! Those grocery costs KILL ME. How can food possibly be SO expensive??!! We all need to eat! Sounds like a good January…..jealous of your snow! You just squeaked by with that grocery number! Nice job. Propane is such an interesting way to heat your house because it’s an all or nothing sort of thing. How long does a fill up last you? Yep–just under! I’m hoping it gets easier to stay under budget (and that we spend less and less!) as time goes on. I wish I could say our propane fill-ups last us several months, but in the winter, a fill up lasts about a month. Mr. ThreeYear likes it warm. We get a final fill up in May that generally lasts us til September or October. Luckily we don’t need air conditioning here, so we just have heating costs. Still, an average of $150-$200 per month is super high, in my opinion. you could just reframe it… 200 x 6 months of winter= 1200… over 12 months… that’s just $100/mon to heat/cool your house for the year :)…respectable number. That would be awesome. Sadly, if I take the average, it’s more like $150 per month heating plus electricity. We’re going to see if we can improve that in NC. But, I have to get around Mr. ThreeYear first. He’d rather save on food than run energy efficient mode and fan. But fans are great! Yep, $57 for a studio! Wow. Next Next post: Life Is Short. So Why Not Buy What You Want?